Cornelius is picking up the car and soon we’ll be jetting down the highway down to Seattle to see a band, eat some good food and do a bit of shopping, American-style. I love road trips…even short ones. Another thing I love is dinner parties and last night I held a small one as a send off to my two friends who will leave on Saturday by bicycle to ride to Mexico and beyond for the next 6 months. It was a wonderful evening, with lots of delicious vegan food, good red wine and lots of laughter. There’s nothing more perfect than that, really. In keeping with this short post, I’m leaving you with this very short “recipe”. Really, it’s not a recipe but just a simple little thing to whip up after dinner that reads as an elegant end to a meal. I love dark chocolate and I love salt. Combine the two and you have a special piece of heaven put onto a little round toast. Cut up a baguette into rounds, drizzle with a little bit of good olive oil, place 2 squares of dark chocolate on top and sprinkle with a bit of fleur du sel. Put into a 350 degree oven until the chocolate gets a bit melty but still retains it’s shape. Remove from oven and serve. Be careful not to burn the roof of your mouth and sit back and enjoy the accolades for the best meal ever. i made your broccoli mac and cheese the other night and paul declared it his new comfort food favorite! Oooh, yes, I’ve made something like this before, and it is absolutely AMAZING. A special piece of heaven for sure! Oh! and one more thing, remember to snap a pic of the ‘biscuits and gravy’ . I love road trips…it has been so long since I have been on a good one. Enjoy yourselves. 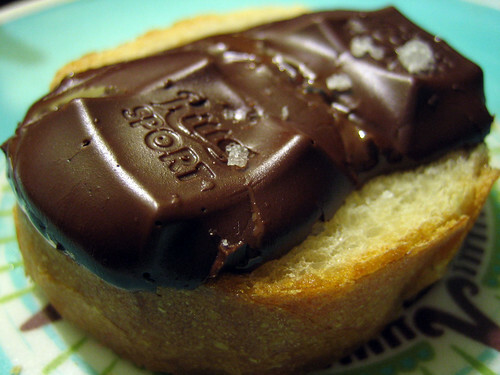 That recipe for the chocolate and salt on toast…sounds too good to be true, I am going to try it, this weekend! This sounds yummy! I visited the Ritter Sport factory store in Germany and bought soooo much chocolate!! Ohmyga…that chocolate looks soooooo good. Have fun in Seattle! Fantastic! When I was a little girl my father would bring me Ritter Sport chocolate bars. Wonderful memory. it was very yummy! thanks jenn! tania, so glad you & paul loved the mac n’ cheese! it’s also one of my favorites. thank you molly! seattle was sunny and lovely and i can’t wait to return. oops, i forgot to take a photo of the biscuits n’ gravy! but it wasn’t very good this time. sigh. hag, roadtrips are the best! i hope you enjoy the chocolate & toast. really, how could you not? haha, that’s so funny brilynn! ritter sport bars are the best, ivonne! you’re lucky to have had them as a kid! mmmm. Can´t beat this. I love a foolproof and dead-easy dessert. Oooh I love the chocolate with a word “sport” on it! You know, those just sound perfect. Tyler and I have had our fill of road trips but a dinner party would sure be nice. Too bad we haven’t made any friends yet out here in rural Saskatchewan! haven’t had the combo of choc + salt ever…must try!